Bogart, James P.. "Frog". The Canadian Encyclopedia, 04 March 2015, Historica Canada. https://www.thecanadianencyclopedia.ca/en/article/frog. Accessed 22 April 2019. Frogs are amphibians belonging to the order Anura. The adult, typically, has no tail or ribs, longer hind limbs than forelimbs, well-developed eyes and skin equipped with mucus and venom glands. 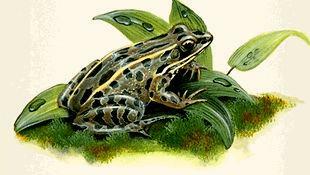 The northern leopard frog is one of 5 frogs introduced to amphibianless Newfoundland (artwork by Jan Sovak, 1989). The bullfrog is the largest Canadian frog (Corel Professional Photos). Frogs are amphibians belonging to the order Anura. The adult, typically, has no tail or ribs, longer hind limbs than forelimbs, well-developed eyes and skin equipped with mucus and venom glands. Frogs, the largest group of amphibians (more than 5000 living species with new species being added continually), are found on all continents except Antarctica. They are grouped into more than 40 families, but this varies according to classification methods. The frogs of the large family Bufonidae, known as toads, generally have relatively drier skin and reduced webbing between their toes. Other frogs commonly called toads include the North American spadefoots (family Scaphiopodidae), the Mexican burrowing toad (family Rhinophrynidae) and the European midwife toad (family Alytidae). Frogs appeared very early in the fossil record. Triadobatrachus, found in Triassic deposits (250-205.7 million years old) in Madagascar, is the earliest known frog. Jurassic deposits (205.7-144.2 million years old) in South America contain frogs having a general body plan similar to some present species. Truly amazing adaptations permit frogs to exploit habitats ranging from rain forests to deserts and from the tropics to the Arctic Circle. 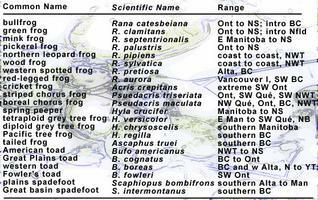 Only 25 species of frogs live in Canada; most are restricted by climatic limitations to extreme southern Canada. The western mountains form an effective east-west barrier restricting such species as red-legged frog, Pacific tree frog, tailed frog and Oregon spotted frog to BC. The tailed frog lives in mountainous streams in southern BC and has some interesting specializations. Adapted to fast-flowing streams, male tailed frogs use the "tail", which is a modified cloaca (bodily waste tract), for internal fertilization of eggs. Tadpoles have expanded mouthparts for adhering to rocks. The western toad is cold-tolerant enough to live at high altitudes in BC and Alberta, and some other frogs such as the wood, tetraploid grey tree and spring peeper can survive freezing. The wood frog ranges above the Arctic Circle in the Yukon, where forest extends along river valleys. This species has an extensive Canadian range occurring from coast to coast except in arid areas and on the southwest coast. The bullfrog is the largest Canadian frog and, although originally an eastern species, has been introduced in BC. 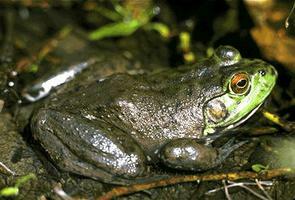 Green frogs have been introduced to the Vancouver area and leopard frogs to Vancouver Island. 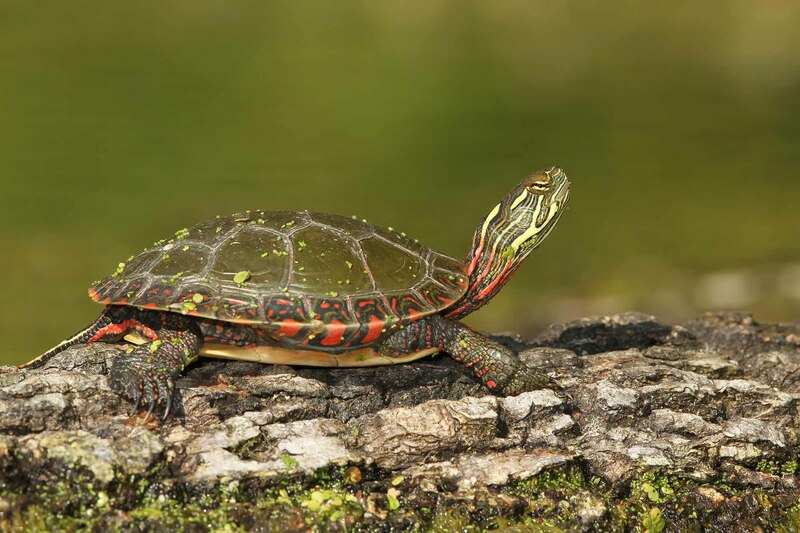 Newfoundland has no native frogs, but green, leopard, wood and chorus frogs, as well as American toads, have been introduced and have become established. Frog eggs are usually fertilized externally and develop into the free-swimming larval stage (tadpole or polliwog). The tadpole is transformed into its adult state through metamorphosis. This process involves numerous morphological and physiological changes: loss of tail and gills, limb and lung development, restructuring of the digestive system from vegetarian to carnivore and alteration of sensory receptors to suit a terrestrial lifestyle. Frogs are ecologically important. As vegetarian tadpoles they are primary consumers in the food chain and later serve as food for various invertebrates and vertebrates. The carnivorous adults consume insects and are in turn consumed by fish, birds and mammals. Although frogs are a relatively minor food item for humans, they are useful in the biological control of insect pests, and certain large species have been introduced to various parts of the world. Frogs are also used in many fields of research and for anatomical studies in educational institutions. Frogs are frequent subjects of folklore and ritual. In dry regions they are associated with life-giving rain and symbolize fertility. 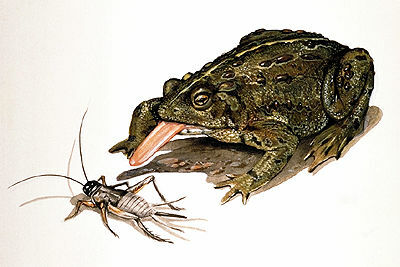 European folklore often features frogs and toads as evil. The nocturnal vocalizations of frogs, usually associated with storms or rains, are considered by some American native peoples to be spiritual outcries. In fact, male vocalizations serve to attract females to favourable breeding sites. In some species, the female perceives only a narrow frequency range, hearing only males of her own species. The call in some species may also delineate a male's breeding territory. Since 1989, alarm has been raised throughout the world over largely unexplained severe reduction or even disappearance of some populations and occasionally entire species of frogs. The World Conservation Union (IUCN) Species Survival Commission sponsors the Amphibian Specialist Group (ASG), which publishes Froglog, a journal carrying news of research throughout the world. ASG is also very active in investigating declines throughout this country and has regional and provincial representatives. Francis R. Cook, Introduction to Canadian Amphibians and Reptiles (1984); William E. Duellman and Linda Trueb, Biology of Amphibians (1986, revised 1994).